I am always on the lookout for new and exciting replica websites where I can find my next top replica watch. This is exactly what Luxuryreplicaus.com seems to be: a new and very resourceful supplier of luxury replica timepieces. But there is no time for chit chats here, let’s unveil the very complex machinery of this business and see if it turns out to be our ultimate source of perfectly crafted replica watches or not. 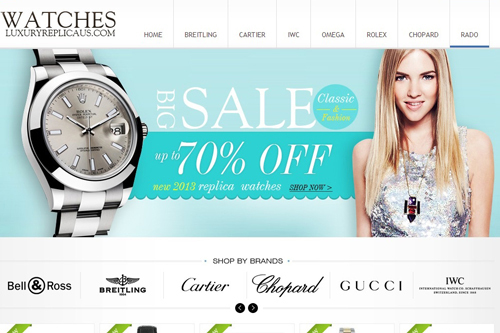 Luxuryreplicaus.com is the kind of website that brightness up your day with its fresh and youthful design. It looks clear, clean and glossy. It doesn’t have a very complicated design. It is actually simpler than you would think: a basic white menu bar at the top, a wide clear blue promotional banner with the offer “Up to 70% OFF” in the center, and a “Shop by brands” menu and sponsored products section in the bottom. Everything is nicely balanced and incredibly appealing. The top menu bar shows only 7 brands, but when you click on one of them you discover that much more are available. Only the best-selling ones have the honor of being displayed on the main menu, the other countless luxury brands are revealed in a secondary left side menu bar. The price range for the Japanese watches is $90-$150 while the Swiss watches cost over $200. The downside of this very impressive selection of replicas is that it is incredibly difficult to sort them as there is no classification into sub-categories, or an Advanced Search or a Filter. The only solution for its visitors is to browse each brand category page by page until they find the replicas that match their preferences. The product description page is pretty chaotic. It starts with price and stock information and it goes on to the promotional incentives. Next it lists the general and quite inclusive specifications about the product, and it continues with the “Description” section. Here, we first find many low quality pictures, followed by the actual description of the watch written in a broken English, but, still, more informative than one would think. The overall product page looks terrible and it fails to serve its purpose only because the information is poorly organized and obviously presented randomly. The company offers two different shipping options. The first one is EMS which takes about 7-14 business days, depending on the delivery country, and it costs $18 while the second option is DHL which takes about 2-5 business days and it costs about $33. The shipping fee is a flat rate and it is not conditioned in any way by the number of items you buy or by the weight of the package. A tracking number is provided for both delivery options. Also, I have noticed that on the page of each product, on the bottom of the description, it says “Free Shipping on all Orders Worldwide.”. It seems that this statement is a lie as a shipping charge is applied regardless of the delivery country. The Return Policy is very difficult to read as it is written in very poor English. It is an outstanding test of endurance just to read this incoherent mumble jumble, but it seems that I have passed this test because with great patience I have managed to read it fully. I must point out the fact that if in the description of the product it says that the Exchange&Return time is 60 days, then there is a totally different story on the actual “Return policy” page. Here you find out that the customer is entitled to a refund or exchange only if the item is returned within the first 7 days from the delivery. After this period no complaints will be taken into consideration. And don’t you dare even think about a repairs warranty because there is no such thing! Luxuryreplicaus.com accepts the following payment methods: Visa, MasterCard, American Express Western Union and bank transfer. Supposedly payments made by Western Union and Bank transfers get 10% off. Still, in the order form the only available payment option is Visa credit card, not Western Union, not Bank Wire, and certainly not Mastercard or AMEX. The only payment option you can use is VISA. The rest is a lie. Pictures: The pictures show the watches from all possible angles, but the quality is too poor and it doesn’t allow you to see all the important details. As expected you also can not zoom in, but the biggest problem with these photos is that they bear the watermark of watchjust.com, a non-existing website and most likely the former domain of luxuryreplicaus.com. Customer service: The company claims to provide 24/7 customer service by email, chat and contact form. Still, the chat button is just for decorative purposes as it doesn’t do a thing when you click it, except for loading the same “Contact Us” page. This being said I do not dare to even test how responsive the email service really is. Sometimes is better not knowing…or not ordering. You make the call. Summary: Luxuryreplicaus.com is just a “pretty face” in the world of replica websites. Its nice looking design cannot compensate for the lack of customer service, for the misrepresented shipping policies, return guarantee and accepted payment options. I cannot recommend this website to anyone because as a wise person would say: it is better to be safe than sorry. please, do subscribe your newsletter.